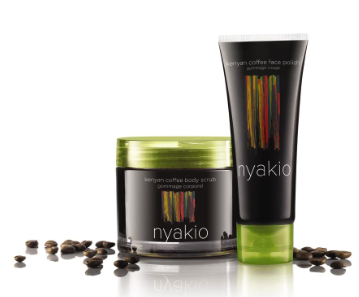 The well-balanced Kenyan Coffee Body Scrub and Kenyan Coffee Face Polish are infused with naturally energizing and exfoliating Kenyan Coffee which has a pleasant, non-bitter aroma. Both products help to reveal fresh, more youthful-looking skin while providing antioxidant benefits. Blending naturally energizing and exfoliating Kenyan Coffee with Jojoba, the Kenyan Coffee Face Polish gently removes dull skin while providing antioxidant benefits. With Lemongrass and Neroli Oils, indigenous to Africa, this unique fusion leaves skin toned, moisturized, soft and immediately radiant. This collection was actually inspired by the beauty secrets of brand founder, Nyakio Kamoche Grieco’s namesake grandmother. She worked on the family’s sustainable coffee farm, and after spending the day outdoors under the sun, she would boil down coffee beans with honey and apply the grounds to her skin and exfoliate using a sugarcane rod.